In the Arctic Summer of 2001, a team of leading Irish sailors and explorers will retrace the famous Northwest Passage from the Atlantic to the Pacific Ocean. The Northwest Passage is marked with a trail of bleached bones and lonely cairns built by the many expeditions that sought this elusive channel to the Orient. Sea charts from Baffin Bay to the Beaufort Sea record the names of the many Irish men whose contribution to the navigation of the Arctic Ocean is monumental. Place names such as Cape Crozier, McClintock Channel, Cape Kellett and McClure Strait commemorate their contribution to those who follow them to the polar seas. The expedition will proclaim their deeds and contribution to the Irish public regarding the navigation and charting of the Arctic region from Greenland, the Canadian Arctic coastline and Islands, to the Alaskan and Siberian coast and islands. The Irish expedition has constructed a modern aluminium sailing boat built to meet the rigours of the Arctic seas, to a French design. The Vessel will be named Northabout, 49 foot long, it will be powered by diesel engine. The boat is being built by the team under the direction of boat builder Jarlath Cunnane and will have its sea trials conducted off the Irish west-coast in spring 2001. The expedition will combine a modern small boat passage and engagement with the polar environs, and the places and ghosts of the lost Franklin Expedition of 1845. 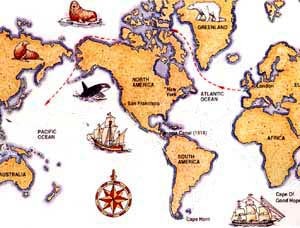 The 7,800 mile voyage will start in Westport in June 2001 and end in Vancouver in the Canadian Pacific via Greenland, Davis Strait, Baffin Bay, Lancaster Sound, Canadian and Alaskan Arctic coastline and islands, Beaufort Sea, Chukchi Sea and the Bering Strait. Progress will be determined by sea ice once the expedition enters the Arctic Ocean. In a very good ice-year, it may be possible to complete the voyage in a single season, but if the channel is closed in by ice it may take two or more. In this event the expedition will haul up the boat on shore or moor it in a safe bay, and then trek to the nearest settlement or air-strip. The team will fly south by small plane, and home to Ireland, to return a season later to continue the passage in the Arctic summer.